Many ladies out there want to sleep better and lose weight faster. We know it’s easier said than done. Presenting FitMiss Z-Slim PM – a supplement which supports better sleep and fat loss. It could be a good alternative with all the skyrocketing prices on the market. Proven sleep ingredients. Vitamin B6, magnesium, zinc, valerian root extract, lemon balm, 5-HTP, and melatonin. Questionable fat-burning components. Copper, chromium, and raspberry ketone. Smell and taste. Unpleasant, to say the least. Valerian (Valeriana officinalis) Root Extract, Lemon Balm (Melissa officinalis) Aerial Extract, 5-HTP (Griffonia simplicifolia) Seed Extract, Razberi-Kâ Raspberry Ketone, Melatonin. Directions: Take one serving (2 capsules), preferably on an empty stomach, 30-60 minutes prior to bedtime. We salute the women out there who know how to take care of their bodies – they exercise regularly, eat healthy, and get enough sleep. Oh, and they supplement smart, too. We’ve reviewed some of these bodybuilding products for women – they’ve impressed us to no end, folks. One product line which stands out is MusclePharm’s FitMiss Series. If you’re an ardent follower of B5, maybe you’ve read our reviews of FitMiss Burn and FitMiss Delight. We’re confident the ladies will love them. On that note, we hope they will love FitMiss Z-Slim PM as well. This product “is a sleep aid by MusclePharm (FitMiss) designed to encourage weight loss while at rest. As a sleep aid, it’s pretty effective but, like most night-time weight-loss supplements, the weight loss aspect is iffy,” per its official website. That is not a customer review, ladies. It’s the actual product description from FitMiss Z-Slim PM’s official website. We’ve never seen a putdown like that from a manufacturer – until now. If you’re not confident about your product, why let customers know about it? It sure doesn’t make sense to us. 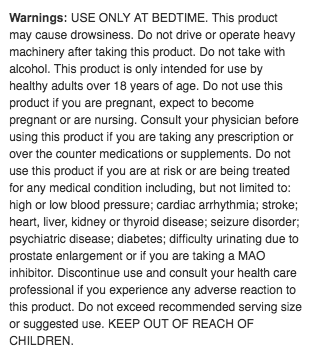 “At FitMiss, we know that healthy sleep habits are essential for overall physical and mental health,” per the manufacturer’s website. “The ingredients in Z-Slim PM supplement the body with a wide array of components that may support nighttime metabolism, enhance quality of sleep as well as levels of sleep and diminish recovery time,” per ths same source. Some sleep supplements such as BPI Niteburn and Applied Nutriceuticals Fat-Free PM intend to help the consumer sleep better and torch fat. While they have their strengths, we have yet to experience a sleep and thermogenic product blowing us away. Can FitMiss Z-Slim PM do that? The first key ingredient is four milligrams of vitamin B6 (as pyridoxine hydrochloride) per serving. This is equal to an impressive 200 percent of the daily value (a value of at least 15 percent is high). You may be wondering what vitamin B6 is doing in a sleep supplement. After all, it’s known more for its cardiovascular, immune, and nervous system health benefits. It also helps metabolize carbs, fats, and proteins. It also helps produce neurotransmitters, red blood cells, and hormones. It turns out vitamin B6 also helps produce serotonin, a neurotransmitter which helps quell anxiety and primes you for a good night’s sleep. Plus, serotonin is a precursor of melatonin (another FitMiss Z-Slim PM ingredient) – a hormone which helps regulate sleep-wake cycles. We’re confident you’ll reap all of these benefits with FitMiss Z-Slim PM’s solid vitamin B6 content. Next up is 113 milligrams of magnesium per serving. This is equal to a respectable 28 percent of the daily value (not as much as other sleep supplements, though). Magnesium helps filter out calcium from the muscles. This produces a soothing effect which will make you fall asleep, for sure. No wonder you feel so sleepy when you drink milk (a great source of magnesium) before you hit the sack. Magnesium is also a potent antioxidant and testosterone booster. This mineral also helps improve heart health and keep inflammation at bay. While FitMiss Z-Slim PM’s magnesium content isn’t at par with many competitors, it will still make an impact. “A high magnesium diet has been found to be associated with deeper, less interrupted sleep. This was shown in a study done by James Penland at the Human Nutrition Research Center in North Dakota,” per an update published on PRLOG.org on April 9, 2012. This supplement also has six milligrams of zinc per serving (equal to 40 percent of the daily value). Just like vitamin B6, zinc helps metabolize melatonin. Not only that, but it also helps “boost the immune system during sleep,” per the company’s official website. Plus, it also helps “increase performance and strength” and “support reproductive health,” per the same source. Ergo, FitMiss Z-Slim PM’s zinc component will help the ladies sleep better and recover faster. We now examine this product’s copper (as copper glycinate) and chromium (as chromium picolinate) content. These are rare among sleep supplements, folks. The main reason they’re in FitMiss Z-Slim PM is because of their fat-burning prowess. This product has 2.5 milligrams of copper per serving – equal to an impressive 125 percent of the daily value. Who would’ve thought copper – known more for its iron absorption and immunity benefits – can torch fat? Apparently, only the folks at MusclePharm (the bodybuilding brand behind FitMiss Z-Slim PM). This sleep supplement also has 20 micrograms of chromium per serving (equal to a so-so 17 percent of the daily value). This is a trace mineral which helps regulate insulin activity for increased muscle growth and fat loss. It also “helps with weight loss through enhanced carbohydrate and lipid metabolism,” per FitMiss Z-Slim PM’s official website. Listen, some customers aren’t satisfied with this product’s thermogenic properties – they say it simply doesn’t work. For our part, we feel copper and chromium aren’t on the same level as, say, l-carnitine, when it comes to torching fat. Long story short, the manufacturer’s fat-burning gamble didn’t pay off. On the other hand, the Fit Miss Slim PM Blend is the true star of the show – it takes up 603 milligrams per serving. Valerian (Valeriana officinalis) root extract: A flowering plant extract which binds to the neurotransmitter GABA. This produces a soothing and calming effect before sleeping. “Overall, the evidence is not overwhelmingly in favor of valerian as a sleep aid, but the anecdotal evidence, combined with a couple positive studies, indicates that there may be something to it,” per the company’s website. Lemon balm (Melissa officinalis) aerial extract: A mild sedative which also helps induce calmness and relaxation before bedtime. 5-HTP (Griffonia simplicifolia) seed extract: This ingredient is a direct precursor of serotonin. With this in mind, “5-HTP may improve certain aspects of sleep,” per FitMiss Z-Slim PM’s official website. Razberi-K raspberry ketone: This is the lone fat-burning component found in the Fit Miss Slim PM Blend. Some experts believe it can intensify the effects of other thermogenic ingredients such as caffeine. However, many human studies involving raspberry ketones remain inconclusive. Melatonin: The hormone which helps regulate sleep-wake cycles and ease jet lag discomfort. Melatonin also helps improve heart health, ward off free radicals, and regulate the immune system and blood sugar levels. We think the FitMiss Z-Slim PM Blend is solid for the most part – you’ll find several staple sleep product ingredients (except raspberry ketone) which should keep you from tossing and turning at night. Unfortunately, the FitMiss Z-Slim PM Blend is proprietary in nature – the manufacturer fails miserably to break down each ingredient amount. All in all, this product has some promise. The reality is, it’s a supplement which combines proven ingredients (vitamin B6, magnesium, zinc, lemon balm, and 5-HTP) with unproven ones (copper, chromium, and raspberry ketone) for sleep and fat-burning purposes. While FitMiss Z-Slim PM may work for some, it may not produce great results in others. It’s an experiment which has serious question marks, to be honest. Vitamin B6 (as pyridoxine hydrochloride), 4 mg: A vitamin which produces serotonin, a neurotransmitter which helps induce feelings of relaxation before sleep. Vitamin B6 is also a precursor of melatonin, a hormone which helps regulate one’s sleep-wake cycles. We’re positive an impressive 200 percent of the daily value will go a long way, folks. Magnesium (as magnesium aspartate), 113 mg: This mineral helps filter out calcium from the muscles to produce a soothing effect before bedtime. Magnesium also helps keep free radicals at bay, ramp up testosterone levels, boost heart health, and ward off inflammation. Twenty-eight percent of the daily value is not the most among sleep products, but it should still help. Zinc (as zinc aspartate), 6 mg: This versatile mineral helps metabolize melatonin and regulate the immune system during sleep. Zinc also helps increase strength and improve reproductive function. Forty percent of the daily value should make an impact. Copper (as copper glycinate), 2.5 mg: The manufacturer’s emphasis on copper for fat loss (125 percent of the daily value) is surprising, considering it is not on the same pedestal as, say, l-carnitine. It’s a risky move, to say the least. Chromium (as chromium picolinate), 20 mcg: The company insists chromium can help women burn fat by metabolizing carbs and lipids. Just like the copper inclusion, it’s a gamble more than anything else. Valerian (Valeriana officinalis) root extract: This ingredient binds to the neurotransmitter GABA to help induce relaxation and quell anxiety before sleeping. It’s a common sleep support ingredient which should produce results. Lemon balm (Melissa officinalis) aerial extract: A mild sedative which also helps produce a relaxing effect before bedtime. 5-HTP (Griffonia simplicifolia) seed extract: This is a direct precursor of serotonin, a neurotransmitter which helps lower anxiety levels for a more relaxed state prior to sleeping. Razberi-K raspberry ketone:. Some experts believe raspberry ketone helps ramp up the effects of other fat-burning ingredients such as caffeine. However, there has been no strong indication from human studies it is a reliable thermogenic component. Melatonin: This hormone helps regulate sleep-wake cycles, boost heart health, keep free radicals at bay, and regulate the immune system. FitMiss Z-Slim PM contains both proven and unproven sleep and fat loss ingredients. That’s a potential recipe for disaster in the bodybuilding supplement industry. It’s like combining brand new and second-rate car parts, folks. Will the engine run smoothly? We like the inclusions of vitamin B6, magnesium, zinc, valerian root extract, lemon balm aerial extract, and melatonin. Expect improved sleep quality, better heart health, and increased free radical protection, among other things. These alone would have helped you sleep like a baby at night. Unfortunately, the manufacturer pays a hefty price for gambling with unproven fat-burning components such as copper, chromium, raspberry ketone. One hundred twenty-five percent the daily value of copper for thermogenic purposes? We’ll stick to regular exercise, a healthy diet, and fat burners (such as l-carnitine) instead, thank you very much. We’re not alone in our assessment. Many women say FitMiss Z-Slim PM did not meet their expectations – it’s not a powerful sleep and thermogenic product, in their opinion. At least this supplement has no fillers. Awesome. Alas, it has a proprietary blend (the FitMIiss Z-Slim PM Blend) – the manufacturer fails to break down the invidual ingredient amounts. Another minus: this product has a rather unpleasant smell and taste. That’s the easiest way to turn customers off and discourage them from buying a product (aside from a high price tag). Despite its upsides, FitMiss Z-Slim PM has glaring loopholes – it’s not a complete flop, but it’s not exactly a smashing success, either. The best word to describe it: mediocre. While FitMiss Z-Slim PM’s sleep benefits are legitimate, its thermogenic properties are questionable, at best. Bear in mind a particular product works better for some individuals and not so well for others. The manufacturer intended FitMiss Z-Slim PM for healthy and active women over the age of 18 who want to improve sleep quality, lose fat, achieve their daily fitness goals, and improve their overall quality of life. While FitMiss Z-Slim PM has no glaring side effects, please consult your physician if you feel doubtful about any of its ingredients. High vitamin B6 content. Solid 200 percent of the daily value. Questionable fat-burning ingredients. Copper, chromium, and raspberry ketone. Proprietary blend. Company fails to break down individual ingredient amounts of FitMiss Z-Slim PM Blend. Smell and taste. Bordering on putrid, honestly. Reputation. Not as stellar as other sleep thermogenic products. We’ve laid out the facts for you, ladies. All we can say is FitMiss Z-Slim PM is an experiment gone wrong – it’s not as good as advertised. Like we said, it’s mediocre, at best. With that in mind, we recommend you buy a different sleep and thermogenic product. FitMiss Z-Slim PM is not a bad product, but you’re better off skipping it.